No local club in your area? If you are a bushwalker in a part of Queensland that does not have a local club, how about starting one? There are probably many others near you that would prefer to walk in a group to share their knowledge and experience of different routes and tracks - and of course it is safer walking together. Bushwalking Queensland can help with the formalities of setting up a club and providing advice on running it. You can then benefit from the experiences of many bushwalkers from affiliated clubs throughout the state. Contact the Secretary if you want to start a club. Choose from six city clubs and another three at Ipswich, Logan and Redland. Popular bushwalking areas lie one to two hours drive north, west and south. Clubs are situated in Bundaberg, Glasshouse (Caboolture), Gold Coast, Laidley, South Burnett (Nanango/Kingaroy), Sunshine Coast, Tamborine Mt. and Toowoomba. 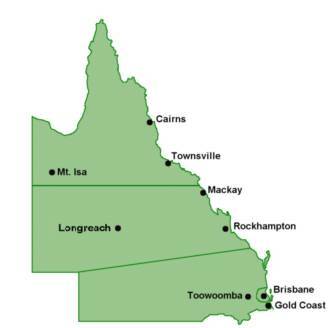 Rockhampton, Gladstone and Mackay have a local club. There are many areas popular with bushwalkers including the Capricorn and Whitsunday coasts; Eungella and Carnarvon National Parks. You will find clubs in Cairns, Atherton and Townsville. The coastal region is tropical with some dense rainforests and there are many national parks including Hinchinbrook Island where you can walk the Thorsborne trail down the eastern coastline.